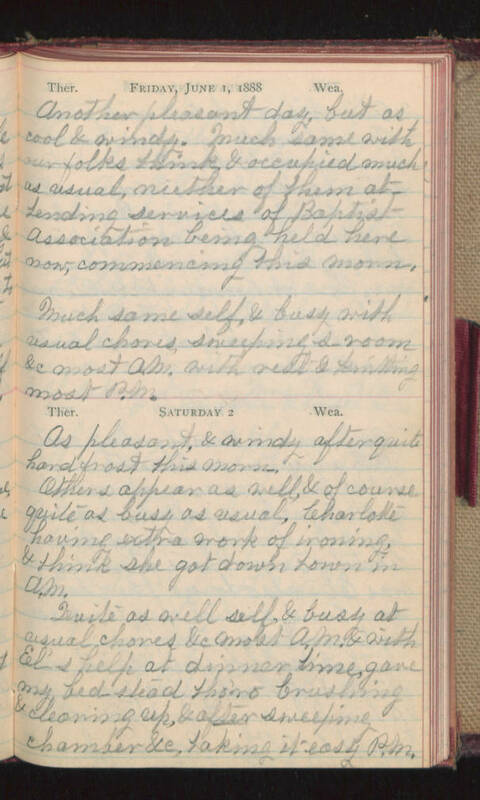 Friday, June 1, 1888 Another pleasant day, but as cool & windy. Much same with our folks think & occupied much as usual, neither of them at Lending services of Baptist Association being held here now, commencing this morn. Much same self, & busy with usual chores, sweeping s-room &c most A.M. with rest & knitting most P.M. Saturday 2 As pleasant, & windy after quite hard frost this morn-. Others appear as well, & of course quite as busy as usual. Charlotte having extra work of ironing, & think she got down town in A.M. Quite as well self, & busy at usual chores &c most A.M. & with El's help at dinner time, gave my bedstead tho'ro brushing & cleaning up, & after sweeping chamber &c, taking it easy P.M.